Trek into one of the popular destinations in the Annapurna region, Ghandruk. The beautiful village of Ghandruk is located in western Nepal and inhabited by Gurung community. Spectacular panorama of the Himalayas in the Annapurans can be spotted from Ghandruk such as Annapurna south, Gangapurna, Annapurna III, Hiunchuli and Machhapuchhre. There’s also an old Gurung museum at the village. The trek is ideal for anyone who is looking into shorter hikes around Pokhara with easy trekking trails and no difficult ascends/descends. The trek begins with drive from Pokhara to Phedi and trek towards Ghandruk crossing Dhampus en-route. Explore the beautiful village of Ghandruk which has a Gurung museum and the mountain views seen from the village is just spectacular from mountains like as Annapurna south to Gangapurna, Annapurna III, Hiunchuli, Machhapuchhre and others. The next day the trace the route to Pothana, stay overnight at Pothana then back to Pokhara and transfer to your hotel. The trek is combination of witnessing the local culture and tradition with great mountain panorama.Day 01: Pokhara to Ghandruk (1540m) 5 hrsMeet at your hotel and drive to Nayapul. Trekking starts from Nayapul ascending upto Ghandruk. En-route witness majestic views of Annapurna range, Manaslu and other mountains. In Ghandruk, visit the Gurung museum. You can spot different mountains from Ghandruk like Annapurna South, Gangapurna, Annapurna II, Hinuchuli, Fishtail. Overnight at Lodge.Day 02: Ghandruk to Pothana (2870m) 5-6 hrsEarly in the morning, enjoy the sunrise over the mountains as the first ray of the sun hits the Himalayas. Then after breakfast, trek to Pothana. At first you will have to descend down to Modi Khola then start climbing up to Landruk village. The trial passes thru paddy fields and reaches Deurali. Trekking further will arrive at Pothana. Overnight at Lodge.Day 03: Pothana to Pokhara 3 hrsEarly in the morning, spent some time at Pothana. Pothana is on a ridge and offers great views of Annapurna massif, Fishtail and other mountains. The trek then begins to Phedi. En-route, witness some good views of the Himalayas and lush green forests. Upon reaching Phedi, your vehicle will be awaiting and drive you to Pokhara, and drop-off at your hotel. Ideal choice for Seniors and families. Day 02: Ghandruk to Pothana (1980m) 5-6 hrs. Day 03: Pothana to Pokhara 3 hrs. Day 01 :Pokhara to Ghandruk (1940m) 5 hrs Meet at your hotel and drive to Nayapul. Trekking starts from Nayapul ascending upto Ghandruk. En-route witness majestic views of Annapurna range, Manaslu and other mountains. In Ghandruk, visit the Gurung museum. You can spot different mountains from Ghandruk like Annapurna South, Gangapurna, Annapurna II, Hinuchuli, Fishtail. Overnight at Lodge. Day 03 :Pothana to Pokhara 3 hrs. Early in the morning, spent some time at Pothana. Pothana is on a ridge and offers great views of Annapurna massif, Fishtail and other mountains. The trek then begins to Phedi. En-route, witness some good views of the Himalayas and lush green forests. Upon reaching Phedi, your vehicle will be awaiting and drive you to Pokhara, and drop-off at your hotel. Shuttles to and from your hotel in Pokhara by private vehicle. Neat and clean rooms in lodges on twin/double sharing basis. Meals (2 Breakfasts, 2 Lunch and 2 Dinner) during the trek. Guide fee and all his/her expenses for meals and accommodation. 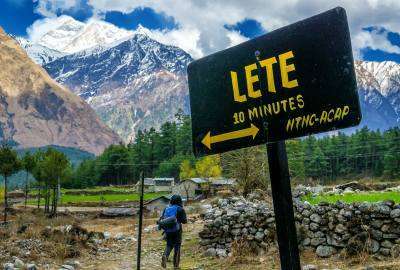 An assistant guide if the number of trekkers are 8 or above. All necessary trekking permits for Ghandruk trek. Transfers, accommodation and meals in Kathmandu and Pokhara. Guided sightseeing and monument site entry fees in cities.